My name is Jordan Locke and I’ve been with LSG Group since September 2013. 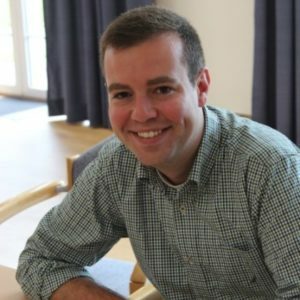 I am currently an International Management Trainee with the company and have had the opportunity to experience the LSG world at several different levels. I started with LSG Sky Chefs in Dallas, Texas, USA in Human Resources. Next, I travelled to Panama City, Panama where I worked in Operations. Now, I’m stationed in Corporate Communications in Neu-Isenburg, Germany. I think it’s really fitting that the first time I tried white asparagus (“spargel” in German) was on a Lufthansa flight that was catered by LSG Sky Chefs. The week prior to my flight, I had been in Germany at a work-related conference. My German colleagues were all abuzz with excitement for what they called, “spargel season.” To be honest, I didn’t quite understand the hype surrounding a vegetable that had just come into season. Coming from Georgia, the food season I get most excited about is BBQ season – and let’s be honest, Americans barbeque all year long! On my trip back to the USA, I had the chance to get a first look at (and taste of) what the fuss was all about. Lufthansa is known for flying great seasonal menus – they always offer goose at Christmas time and white asparagus when it is in season. After my first taste of the veggie, I could see why the Germans like it so much. Little did I know at that time that I would be moving Frankfurt in less than a year and would get the full-fledged spargel season experience. I would say that late spring in Germany has been one of my favorite times here. The days are longer, flowers are blooming, beer gardens are re-opening, and – of course – asparagus and strawberries are for sale at every local market and restaurant. 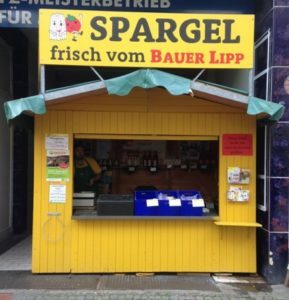 There are even pop-up stands all across the German cities and villages where people can buy locally-grown asparagus straight from the farmers themselves. I promise that I’m not exaggerating when I say that Germans go crazy for this strange-looking vegetable! They even refer to it as “white gold”! 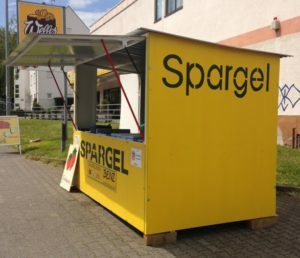 Many people go out of their way to visit spargel stands to make sure that they’re purchasing asparagus that was grown in a particular region of Germany. You can get pickled spargel, spargel soup, boiled whole spargel, chopped spargel in cream sauce, spargel topped with melted butter, spargel salad, spargel with hollandaise – it seems like the possibilities are endless! 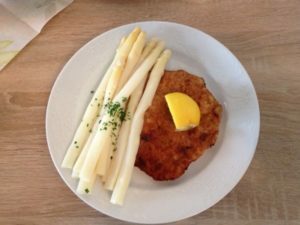 My personal favorite is asparagus served with a nice schnitzel and boiled potatoes. For me, that is German cuisine at its finest! Sweat the onion in butter, add potato cubes and asparagus pieces. Deglaze with the white wine and top up with chicken stock. Add bay leaf, sugar, salt and pepper. Once the potatoes and asparagus are done, remove the bay leaf. You can also thicken the stew with a bit of starch, if you like. Serve the soup in bowls and garnish with the herbs. For the dressing: 20 g of (cut and blanched) potato cubes, 50 ml of veal stock, 5 ml of herb vinegar, 20 ml grapeseed oil or safflower oil, sugar, salt and pepper, and nutmeg to taste. Peel the asparagus and cut into 1 cm pieces, blanch lightly in water with sugar and salt. Remove from the pan and leave to cool rapidly in the fridge. Mix the dressing ingredients well and season to taste. Add to the asparagus and mix carefully. Finally, sprinkle over the herbs. Goes well with shrimp. Are you a fellow spargel lover? Comment below to share your experience, share a recipe, or tell us which region grows your favorite asparagus!